Taxicabs have a long history. They provide transportation services to people, especially in urban areas and areas where other public means of transport were/are not yet available. Generally, taxicabs are a part of paratransit transportation, which is the layer between private automobiles and public transport. There are three categories of paratransit systems: hire and drive systems, hail or phone systems, and systems that require prior arrangements (Bailey and Clark, 1987 - Bailey and Clark, 1992). The coordination and planning of a taxi fleet requires a lot of organisational work. The taxis have to be sent to the customers, and in time without any delay. Furthermore, the waiting time of the customers has to be minimised and the booking of the cabs has to be made efficiently. Currently, different systems are employed for this process, such as radio communication, global positioning systems (Liao, 2003), mobile phones and location based services (Silva and Mateus, 2003). Small taxi companies usually do not use radio systems or location based services. They instead rely on mobile phones to take the orders from clients and to coordinate different cabs. Accurate coordination is especially important in the case of rather small taxi companies that run pre-booked services. The installation of a radio communication centre for the coordination of the cars would not be economical for only a few cabs. The planning is either done using simple software, notebooks, or in the head of the owner of the business. Furthermore, the image of the company to the outside and the relationship to regular customers is very important. The cars have to be clean and the drivers have to have a trustworthy and appealing appearance. This is in part because companies are entrusted with credit card information given to them by customers. Provision, collection, storage, coordination and sharing of customer related information (e.g. name, address, credit card information, etc.). Analysis of cab efficiency (e.g. calculation of vacant periods). Coordination of cabs within a company. Coordination of cabs between different companies. As mentioned above, different taxi companies collaborate with each other when needed. In case of overbookings, they delegate the orders to other taxi companies with which they have established trusted business relationships. Collaboration is also established for longer distance trips to find, for most of the time, a fare for both directions. In order to make this system work, the companies have to trust each other. As there is always the possibility of one company taking away the other companies’ customers, trust becomes an essential part of collaboration. The amount of information given to other companies can be restricted, while information within the company should not be restricted. Furthermore, trust between the company and the customers has to be established. The customers trust the taxi company with their credit card information. This trust implies that the car company will not misuse this information nor share it freely with others. 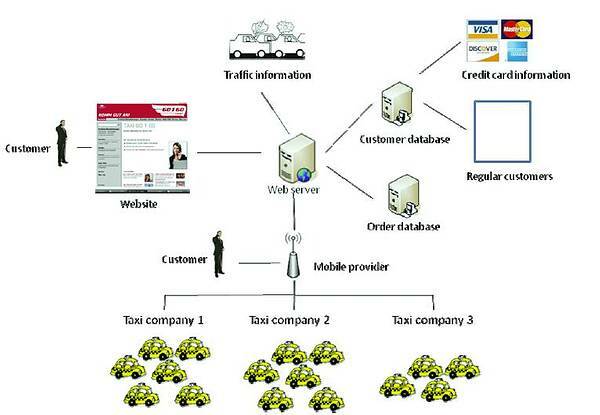 Figure 2: Pre-order taxi community and its stakeholders. The following scenarios give a short overview of the possible uses of the PICOS project. Sarah is the owner of a small pre-order taxi company, comprising of three cars. The business is family owned and was created by her father about 30 years ago. Since three cars are more easily coordinated using mobile devices than a person employed in a central cb radio station, only mobile devices are used. Recently, Sarah adopted the PICOS technology for her taxi service. Each day, customers call her on her mobile to arrange pick-ups. Over the last few years she has acquired a larger number of regular customers that prefer her service because of her reliability. Even when her cars are overbooked, Sarah reliably organises the pick-up. In such a case, the PICOS project eases the coordination with acquainted and trusted taxi companies. The PICOS system allows Sarah to reach all the business partners she trusts only by choosing the desired network and pushing one button. Therefore, a lot of time that would be spent on calling the different companies individually is saved. Furthermore Sarah can do this kind of coordination while driving, because she does not have to look up all her phone numbers, which means she can concentrate on the street. Roger founded his pre-order taxi company about 2 years ago. Before that, he was taxi driver for a big company. Taking all his knowledge, he decided to become self-employed and opened a small company with four cabs. His prior knowledge helped him set up the necessary infrastructure. Using the PICOS technology, he is running a cooperative website. Through this site, customers can book cars easily over a secure page. Regular customers also have the possibility to create an account and log on. Ordering a cab now takes less than a minute. As soon as the customers submit the request, Roger and his co-workers receive an encrypted e-mail. Since the PICOS technology runs on a central system that connects the handheld devices of all taxi drivers in the company and synchronises the appointments and pick-up times, it immediately displays the desired pick-up time and location in the calendar. It is then automatically assigned to the driver who best fits the job, in consideration of the other bookings. In case of overbookings, a warning sign is displayed to Roger and his co-workers. Roger can easily accept an appointment or delegate it to business partners in the case of overbookings by just toggling one button (either “accept” or “delegate order”) on the display. An e-mail to confirm the modalities of the pick-up order (date, time, estimated price) is sent to the customer. The associated companies that can be contacted in case of overbookings are also part of the network. Using the same method as described above, these companies can also accept or reject the appointment. The trust between the customers and Roger’s company is established through different channels. Firstly, all communications are transmitted using secure channels. Secondly, the taxi company has obtained credentials from the government that designate it as a pre-order cab company. Through these online credentials, the users are assured that Roger’s company is in fact a taxi company. Thirdly, PICOS enables the customers to track all information they submit to the company’s website. This includes credit card information as well as personal data. The website is partially financed by advertisements and therefore it is essential for the customers to know where their data has gone and that it is not given to other companies. Furthermore, the customers get an e-mail stating the name of the driver and the number of the car that is going to pick them up. In case of overbookings or changes, the customers will also be notified either by e-mail or by text message. At CMO cabs, a small pre-order taxi company with three cars, the entire booking system is based on phone communication and e-mail services via BlackBerry phones. The customers can book cabs by calling the company or by writing an e-mail. Since the possibility of somebody losing a BlackBerry or getting it destroyed is quite likely, the company has recently adapted the PICOS framework. The framework establishes trust between the company and its customers. Daily backups of the stored data (e-mails, contacts, appointments) and credentials for the user of the phone prevent data loss and access by unauthorised personnel. The scenarios introduced above show the possibilities that the PICOS system can offer to the taxi community. In this context, the PICOS system allows for an optimised coordination of cabs within a company and between acquainted taxi companies. While previously (mobile) phones, paper sheets and the human brain were used for the coordination and arrangement of the pick ups, the employment of mobile technologies makes this system more efficient and reliable. While critical situations such as overbookings could be overlooked in the past, they are now highlighted by the system. Time consuming searches of the address book for potential partners is unnecessary, and sheets of paper that can be lost or simply disappear do not exist anymore. Instead, the information is stored in a database and backups are made frequently. The advanced security paradigms implemented in the PICOS system foster trust between different companies and between the offering company and its customers. Only the customer information needed to carry out the order (e.g. pick-up location and time) is immediately delivered to the taxi drivers, and the customers get valuable feedback (e.g. name of taxi driver). Information that the driver does not necessarily need to execute the order (e.g. credit card information) is not submitted. The use of mobile devices eases the employment of the system in a mobile environment such as taxis, and allows for the flexibility needed. Bailey W.A., Clark T.D., ‘A simulation analysis of demand and fleet size effects on taxicab service rates’, in Proceedings of the 19th Conference on Winter Simulation (Atlanta, Georgia, United States, December 14-16, 1987). A. Thesen, H. Grant, and W. D. Kelton, Eds. WSC '87. ACM, New York, NY, 838-844, DOI= http://doi.acm.org/10.1145/318371.318705. 1987. Bailey W.A., Clark T.D., ‘Taxi management and route control: a systems study and simulation experiment’, in Proceedings of the 24th Conference on Winter Simulation (Arlington, Virginia, United States, December 13-16, 1992). WSC '92. ACM, New York, NY, 1217-1222. DOI= http://doi.acm.org/10.1145/167293.167897. 1992. Liao Z., ‘Real-time taxi dispatching using Global Positioning Systems’, Communications of the ACM 46, 5 (May. 2003), 81-83. DOI= http://doi.acm.org/10.1145/769800.769806. 2003. Silva A.P., Mateus G.R., ‘Location-Based Taxi Service in Wireless Communication Environment’, in Proceedings of the 36th Annual Symposium on Simulation (March 30 – April 02, 2003), IEEE Computer Society, Washington, DC, 47. 2003.